This dataset provides plot-level estimates of basal area, aboveground biomass, number of trees, maximum tree height, and basal-area-weighted wood specific gravity that were derived from observations of nearly 6,700 individual trees. 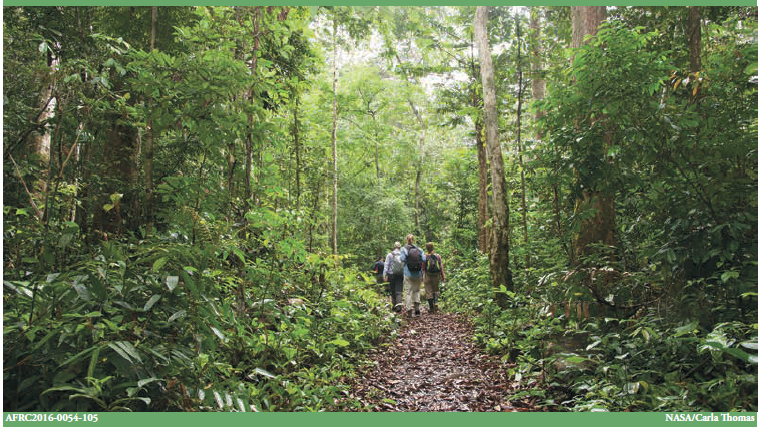 Details of individual trees includes tree family, species, DBH, height of each tree, and their location within 25 x 25 m subplots across the Mondah Forest of Gabon. This dataset includes footprint-level canopy structure products derived from data collected using NASA's Land, Vegetation, and Ice Sensor (LVIS) during flights over five forested sites in Gabon. Three types of canopy structure information are included for each flight: 1) vertical profiles of canopy cover fraction in 1-meter bins, 2) vertical profiles of plant area index (PAI) in 1-meter bins, and 3) footprint summary data of total recorded energy, leaf area index, canopy cover fraction, and vertical foliage profiles in 10-meter bins. The AfriSAR mission was an airborne campaign that collected radar and field measurements of tropical forests in Gabon, West Africa. The mission was a NASA collaboration with the European Space Agency (ESA) and the Gabonese Space Agency. See all data from the AfriSAR mission.